development. In addition to regular papers, the workshop will include invited talks, poster presentations, discussion sessions, and Walter Kosonocky Award. Extra time has been added to permit longer discussion and more informal meeting time. Submission of papers: Abstracts should be submitted electronically to the Technical Program Chair, Gennadiy Agranov (see email in the pdf on IISW site). The deadline for abstracts submission is January 23, 2013. Not much information is given about the sensor. It supports 1940 x 1080p video at 30fps and 1280 x 720p video at 60fps. The built-in scalar function makes it possible to shrink all of the 8MP to perform 16:9 cropping for video. Power consumption is 270 mW in 8MP JPEG@15fps mode or 202 mW in 2MP YUV@30mode which are quite good numbers, possibly due to an advanced process node used for ISP die. PR Newswire: Omnivision reported its quarterly results on the higher end of its guidance: $390.1M, as compared to $258.1M in the previous quarter, and $217.9M a year ago. GAAP net income $10.3M, as compared to $2.3M in the previous quarter, and $21.1M a year ago. GAAP gross margin is 16.6%, as compared to 19.1% in the previous quarter and 30.6% a year ago. The sequential decrease was attributed to an increase in shipment mix of advanced products that carried high manufacturing costs. "In addition, I am pleased to announce the addition of Raymond Wu to OmniVision's management team," said Shaw Hong, Omnivision's CEO. "Raymond, one of our co-founders, has agreed to re-join us as our President, effective December 1, 2012. During his previous tenure, Raymond's intellect, experience and influence extended to market development, engineering and sales. We are enthused by his return, and with his knowledge of our company and the industry, I expect Raymond to make significant contributions to OmniVision's continued growth in the years to come." Raymond Wu used to be Omnivision's EVP and left the company in August 2006. Update: SeekingAlpha published Omnivision's earnings call transcript with more details on its business. The influence of camera warm-up on distance measurement is analyzed: a warm-up of 40 minutes is suggested to obtain the measurement stability, especially in the case of the PMD's CamCube3.0. 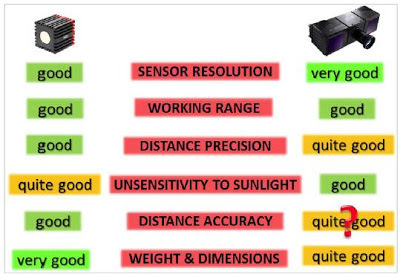 Depth accuracy tests have shown similar numbers of of order of millimeters for both cameras. Mesa's SR-4000 is on the left, PMD's CamCube3.0 on the right. Question mark means the accuracy has not been measured yet. The evolution of the eye and image sensors was overviewed. The possible disadvantage of the inverted structures of human eyes and FSI image sensors was solved with the use of the lightpipe function. A novel “SmartFSI” image sensor with stacked lightpipe structure demonstrated a high performance. A 1.5 Mpixel RGBZ image sensor to capture color (RGB) and depth (Z) at the same time is presented. Time-Of-Flight (TOF) method is used for depth. Color pixels and depth pixels are placed together in pixel array with specially designed RGBZ pattern. It demonstrates excellent depth performance and full color image. Among various semiconductor devices, electronically active oxide thin ﬁlm transistors (TFTs) have received considerable attention for a wide range of device applications. In this presentation, we review various device applications utilizing amorphous oxide semiconductor TFT, which include photo-sensor, image sensor and other device applications. In this paper a low-noise high-gain readout circuit interface for high output impedance sensors is presented. Theoretical noise analysis and simulation results shows that by using a high-gain switched capacitor ampliﬁer, the thermal noise is greatly reduced if the dominant reset noise component at the charge summing node is canceled. 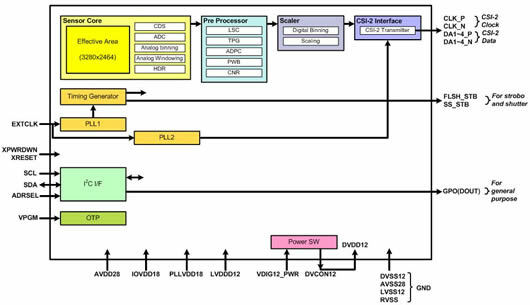 A 0.5 V PWM CMOS Imager chip with threshold variation cancelling and programmable threshold control scheme was implemented. It achieves 0.055% pixel FPN, 0.65 LSBrms random noise at dark, and 82 dB dynamic range at 11.8 fps. 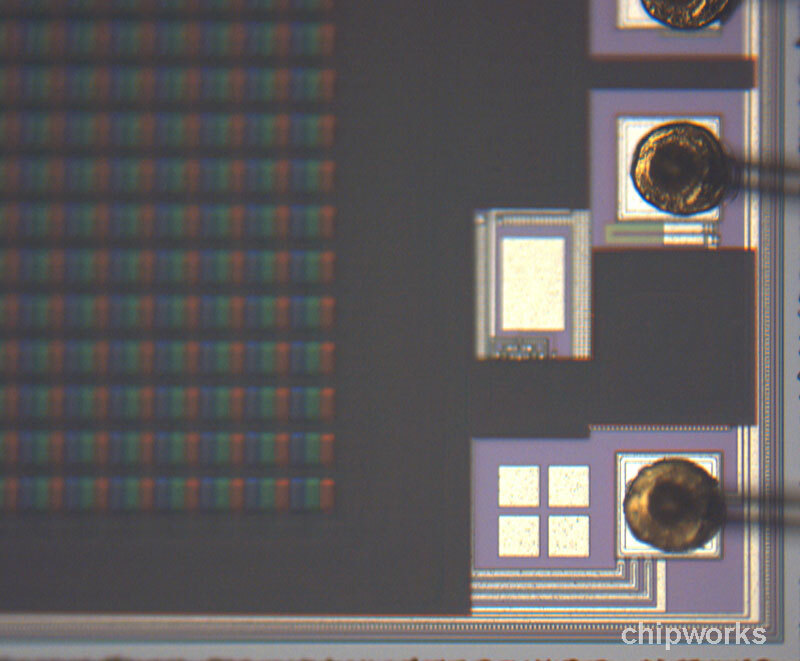 The chip consumes 4.95 µW at 11.8 fps; results in a iFOM as 163.9 pW/f-p. The hybrid sensor and display pixel proposed consists of: light sensor and integrated display onto the backplane. Phototransistors incorporating both sensing and switching on the same device was used. The backplane was implemented using a driving TFT and an OLED. The grey scale is generated by pulse-height and width voltage modulation. Albert Theuwissen concludes his series of reports by the discussion of poLight AF technology presented at the Symposium. Leap Motion added 4 more video demos to its third-party developers playlist, so that the list currently has 7 videos. Most of the new videos demo gesture control in games. The T2000 3Gbps CMOS Image Capture Module simultaneously tests up to 64 devices in parallel, significantly reducing test costs. In addition to improving yields by performing at-speed testing in production, the module also can be used to shorten turnaround time in verifying semiconductor designs on first silicon. 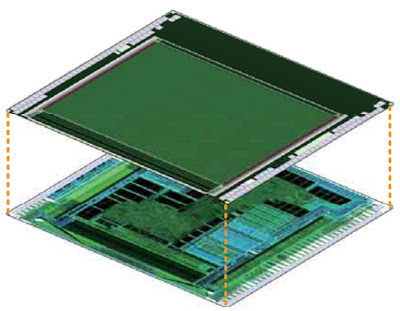 "Ongoing, rapid improvements in the performance and resolution of CMOS image sensors as well as the growing volume of electronic products depending upon them continue to exert downward pressure on production costs," said Satoru Nagumo, senior vice president of the ASD Test Business Group at Advantest Corporation. "Our newest generation of image-capturing technology enables our customers to lower the cost of test while meeting the performance requirements for advanced image sensors." PR Newswire: Toshiba announces a 13MP, 1.12um pixel sensor claimed to deliver high-image quality equivalent to a 1.4um pixel. The new T4K37 feature BSI and integrated color noise reduction (CNR) and fits into an 8.5mm x 8.5mm size camera module. 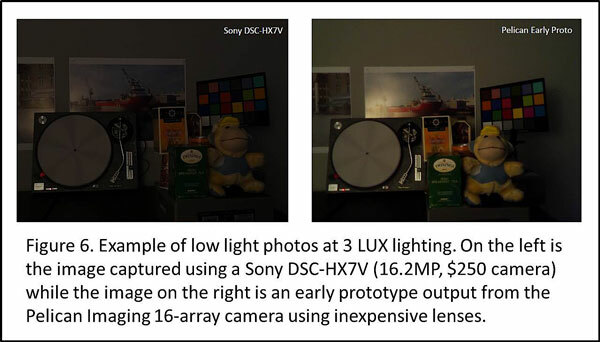 The miniaturization of pixel size impacts performance of light sensitivity and SNR in today's 1.12um pixel image sensors. 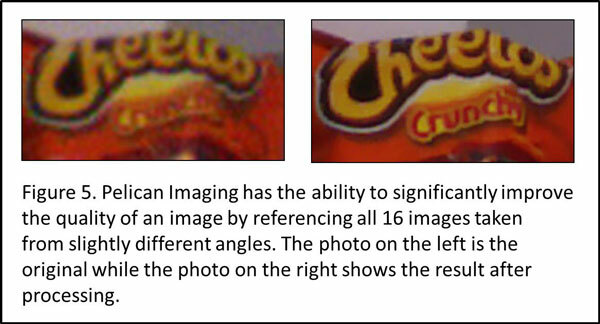 BSI technology helps improve sensitivity, but is said to fall short on elevating image quality. Toshiba developed its newest image sensor with BSI and CNR integrated on the sensor to address both low-light sensitivity and SNR. 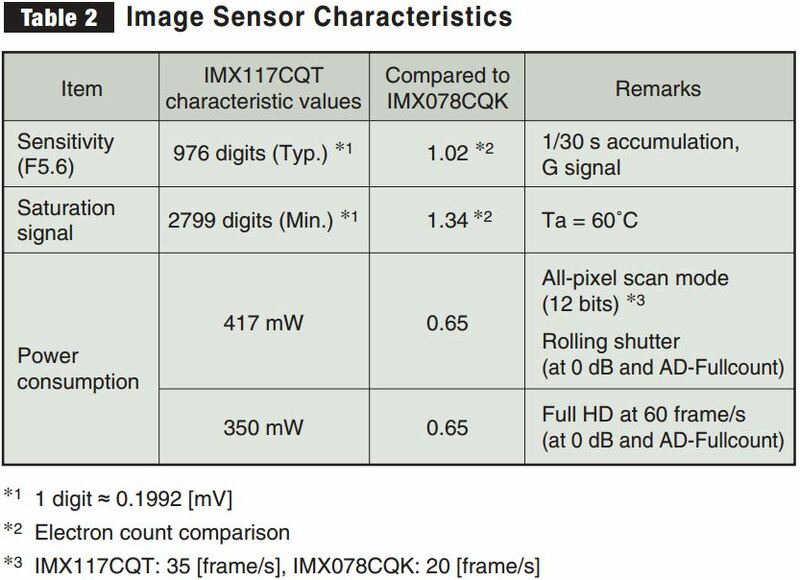 As a result, the Toshiba CMOS image sensor provides approximately 1.5 times higher SNR than a 1.12um pixel sensor with no CNR. Samples of the new Toshiba sensor, the T4K37, will be available in December 2012. Sample pricing begins at $20.00. "CNR Our circuit has adopted the type to compare the image between frames by a digital filter circuit to suppress the color noise, without compromising a sense of resolution, of 1.12 micrometer pixel circuit not installed CNR SN ratio of about 1.5 times to accomplish, to achieve the SN ratio of the pixel corresponding to 1.4 micrometers." 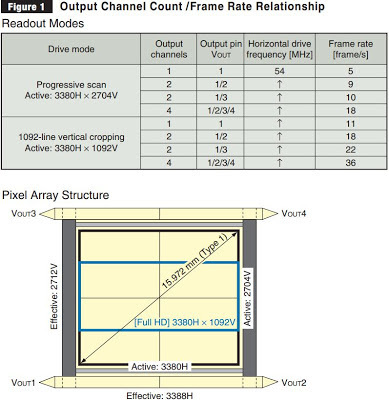 Update: Toshiba published a product page of the 1/3.07-inch T4K37 sensor. The block diagram shows a location of Color Noise Reduction part (CNR). The output format is either 8b or 10b. Albert Theuwissen continues his notes from the Fraunhofer Symposium in Jena, Germany. The second part covers Heptagon wafer level optics and a prototype multi-aperture camera, talks about Lytro news and technical details, Fraunhofer in-house CIS process, Nemotec wafer scale optics, ST pixel simulations, and more. Albert Theuwissen published a first part of his report from Symposium on Microoptical Imaging and Projection being held these days in Fraunhofer Institute, Jena, Germany. The first part of the report talks about multi-aperture imaging presented by Pelican Imaging, LinX, Ascentia, Fraunhofer and Onera. Business Wire: ON Semiconductor collaborated with Teledyne Imaging Sensors to manufacture an Extremely Large Stitched Read Out Integrated Circuit (ELS ROIC) for astronomy. The 16MP H4RG-15 consists of Teledyne’s HgCdTe detector material hybridized to a CMOS readout circuit. It is said to be the largest sensor ever produced for IR astronomy. 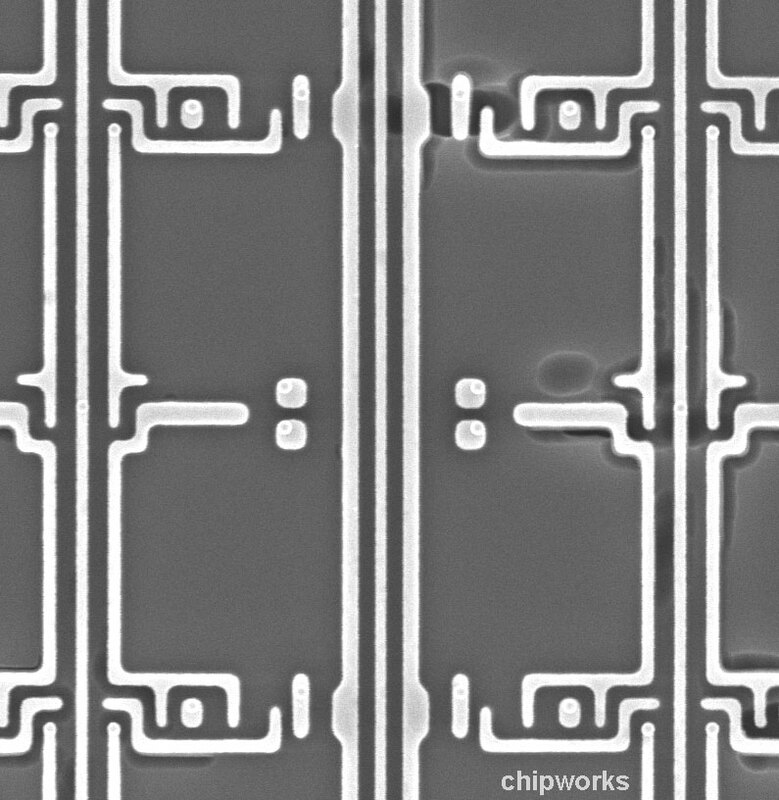 The H4RG-15 63 mm x 63 mm stitched CMOS ROIC uses ON Semiconductor’s proprietary 180nm process. The ROIC is so large that only four die fit onto a 200 mm wafer. The H4RG-15 ROICs were manufactured at ON Semiconductor’s fab located in Gresham, Oregon. With this project, ON Semiconductor has demonstrated that it can successfully produce the H4RG-15 with the yield required for this next generation sensor. The H4RG-15 sensor has been installed at the University of Hawaii’s observatory on Mauna Kea to confirm the performance of the sensor under telescope observing conditions. "The resolution with which images can be captured using this new sensor system represents a major step forward in the progression of IR astronomy," said Dr. Donald Hall of the Institute for Astronomy at the University of Hawaii, who is the principal investigator for the NSF-funded H4RG-15 development program. There are few new Leap Motion's gesture control videos appeared on Youtube. The videos are from different third party developers that Leap Motion kindly collected into a single playlist. ST patent application US20120286135 "Low drop-out regulator with distributed output network" by Jingfeng Gong, Yann Desprez-Le-Goarant (Singapore), proposed a regulator for a pixel array with distributed output transistor that "improves localized heat dissipation by spatially-distributing transistors, and reduces IR drop across an output track by providing a consistent output voltage at each output node located along the output track." (I'd say with improved consistency, not exactly the same voltages). Teledyne DALSA has been honored as Business of the Year by the Netherlands-Canadian Chamber of Commerce (NCCC). The NCCC’s annual award is presented to Canadian companies with a subsidiary in the Netherlands or to Dutch companies active in Canada. The selection committee noted the success of Teledyne DALSA’s Netherlands-based Professional Imaging division. Located in the High Tech Campus in Eindhoven, which has been called “the smartest square kilometer in Europe” by Fortune magazine, the division developing large format image sensors and medical x-ray detectors. "We are delighted and humbled to accept this honor," commented Dr. Edwin Roks, EVP and Managing Director of Teledyne DALSA’s Eindhoven operations. "None of our innovation happens in isolation. The collaboration between our groups in Canada and in The Netherlands is extremely important for us. I would like to thank the embassy and the NCCC for their role in facilitating transatlantic cooperation, and we will strive to continue this valuable, productive relationship." Imaging Resource: Bryce Bayer, the Eastman Kodak scientist who invented the almost standard color filter pattern that bears his name, has passed away. 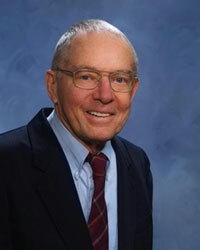 Bayer, 83, died on November 13th in Bath, Maine. The Bayer Filter array was patented in 1976, U.S. Patent No. 3,971,065. 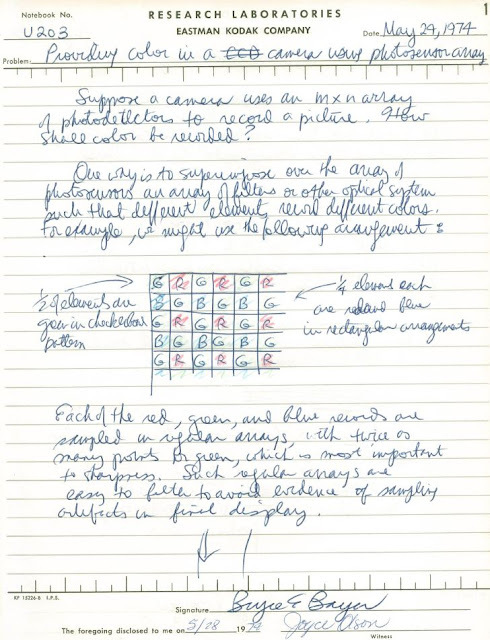 Bayer is also known for his recursively defined matrix used in ordered dithering. Sharp has been mostly known by its CCDs. The 2012 Sharp Components Catalog does not even mention CMOS sensors as a product category. 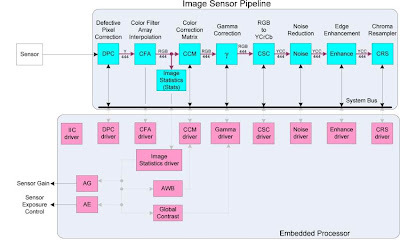 However, one the the Oct. 2012 Cadence success stories reveals that "Recently Sharp embarked on designing a new consumer electronics CMOS image sensor." "Cadence helped us achieve our target in the highly competitive arena of CMOS image sensors,” says Naoya Fujita, GM of Product Planning, Electronic Components and Devices Group, Sharp. "We were able to deliver the highest quality of silicon and get to market significantly faster than would have been possible with our previous flow. We exceeded our design requirements and expectations, and look forward to continued collaboration with Cadence to meet the growing demand for high-quality CMOS images sensors." The project will benefit from the experience of each consortium partner. Caeleste is responsible for the project supervision and the design of the analog section. Easics is designing the digital section using IMEC standard DARE library for radiation hardness. Easics is also in charge of the test system development. SELEX Galileo joins as IR/cryogenic expert and will provide support for cryogenic operation, test and evaluation. Following the successful completion of this demonstrator phase, an industrialized version will be envisaged, aiming at providing such flexible and standard ASIC to European Companies willing to simplify the design of infrared instruments for space application. Thanks to BD for sending me the news! University of Trento, Trento, Italy. Multispectral Imaging: When CMOS Does the Trick! THz Imaging: What You See and What You Don’t! "The founders of Pelican Imaging started with the idea of using an array of low resolution photoplanes coupled to an array of small lenses and using the overlapping information to create astounding images and videos. The core intellectual property (IP) starts by using an array of 16 inexpensive, mass produced accurately aligned cameras. 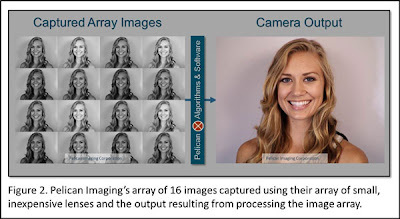 The array creates 16 images – each one slightly different from the other since it is capturing the image from a slightly different angle. Because the input images all come from lenses and pixel technologies that are mature and low cost, the yield of the solution should be very good. 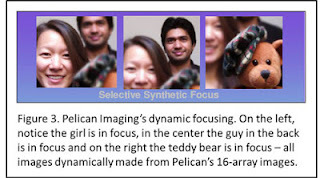 You can see the 16 ‘similar’ images captured by using the 16 lenses in Figure 2." 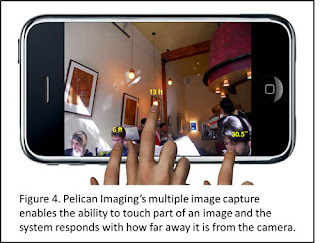 "Because each image is taken from a slightly different angle, the processing logic can determine the distance objects are from the camera, thus providing a depth map of the scene... And, the 16 slightly different versions of the photo offer the ability for Pelican’s proprietary (and patent pending) software to synthesize a higher resolution image." 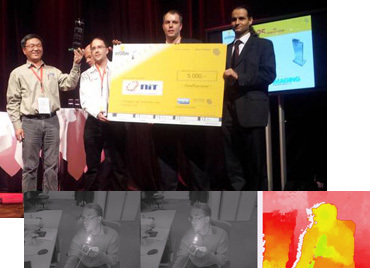 New Imaging Technologies MAGIC 3D solution has been chosen as the winner of the VISION Award 2012 by the jury. The new MAGIC 3D solution offers HDR stereo vision capability. PRNewswire: Meanwhile, Altera presented its FPGA-based automotive rear view camera, forward looking stereo camera, and radar/camera fusion systems. Marketwire: Lattice and New Imaging Technology presented HDR camera based on NIT NSC1005 and LatticeECP3 FPGA. 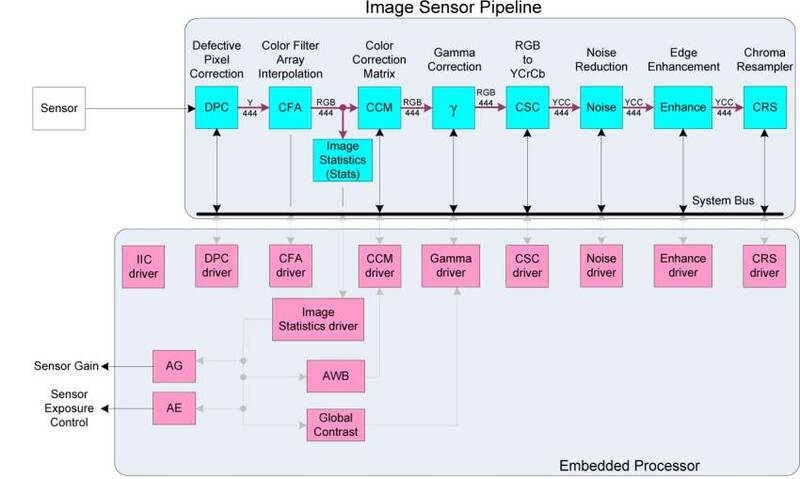 Update: Xilinx published its FPGA reference design documentation based on ON Semi VITA-2000 image sensor. Albert Theuwissen describes three ways to measure conversion gain. Some of them are well known, others less so. Educating read! Benzinga: Sony announces that it is planning to issue a 150 billion yen ($1.9 billion) zero coupon convertible bond maturing in 2017. The 60 billion yen ($750 million) is slated for the expansion of Sony's CMOS sensor production facilities in Nagasaki (announced on June 22, 2012, with an expected total capital expenditure of approximately 80 billion yen, expected to be completed during the first half of the fiscal year ending March 31, 2014). 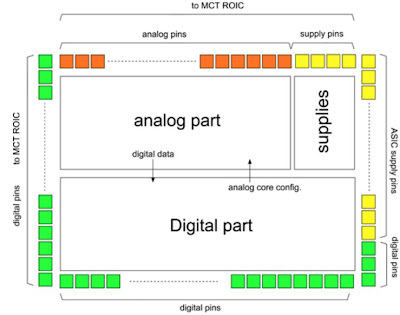 Business Wire: Tessera announces its wholly owned subsidiary, DigitalOptics Corporation ("DOC") will focus its efforts on its core MEMS camera module business. DOC plans to reduce its workforce – not including those related to manufacturing operations in Zhuhai, China – by up to 40%. As part of this process DOC plans to cease operations at its facility in Tel Aviv, Israel and to pursue a possible sale of, or other strategic alternatives for, its facility in Charlotte, North Carolina. These two facilities are not central to the MEMS camera module opportunity. Given full effect, the planned actions would reduce the non-Zhuhai workforce of 450 by approximately 180 employees. DOC anticipates that the staff reductions and facility dispositions will be spread over the next two to three quarters to ensure continuity in the business as well as compliance with relevant legal requirements. Tel Aviv facility was developing EDoF, OptiML Zoom, OptiML Low-Light and other computational optics technologies. It was based on two acquired startups - Eyesquad and Dblur, combined with few people left from Shellcase. A number of key people of this group left Tessera a year ago, in Aug. 2011. "Camera module features and functions have increasing importance to consumers in the mobile phone market. The changes announced today will focus DOC on that market and are an important part of driving the business towards profitability," said Robert A. Young, president and CEO of Tessera. 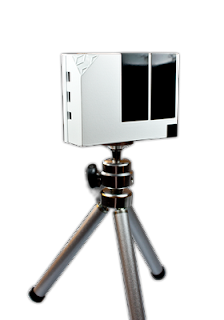 New Scale Technologies’ M3 focus modules have been designed into the next-generation AWARE cameras, the Duke University's gigapixel cameras assembled from many 14MP Aptina sensors. The custom module with SQUIGGLE piezoelectric motor has a cross section less than 6 X 10 mm, a stroke of 2.5 mm and resolution of 0.5um. It moves a lens weighing several grams, so that each of the hundreds lenses can adjust its focus independently. 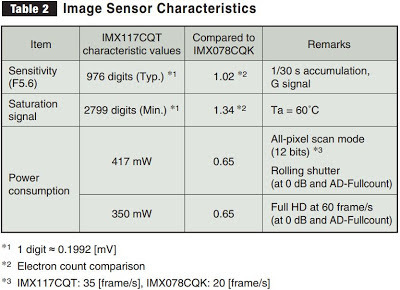 The best image sensors come from Essex, UK, or so Electronics Weekly says. "Most of the image sensors in space or in ground-based astronomy are made here in Chelmsford," John Kemp, marketing and applications manager at e2v tells to the newspaper. Spacecraft Kepler, Solar Dynamics Observatory, NASA’s Curiosity Mars rover, Hubble space telescope, 1 Gigapixel Gaia camera, all use e2v sensors. The company’s flagship CCD sensors are made in Chelmsford, Essex, UK on a bulk/epitaxial 6-inch process whose details are the result of 20 years of experience, and remain confidential. The CMOS sensors are made on outside fabs. Business Wire: Aptina introduces the AP0100AT and AP0101AT, two dedicated automotive image co-processors supportion the company's HDR sensors. 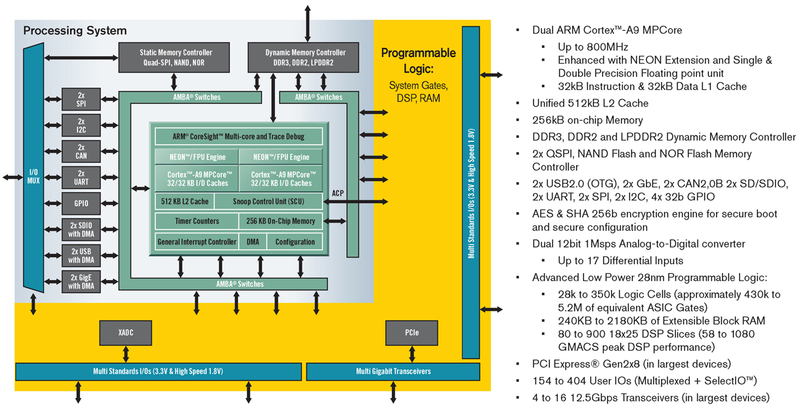 The two-chip solution of sensor and co-processor allows for multiple camera price and performance points with re-use of circuit board design, fast time to market and design flexibility. Sensor performance is enhanced by the reduction in heat resulting from a separate co-processor chip while at the same time enabling high performance features. Both co-processors provide color processing, AWB and AE support, noise reduction, and Adaptive Local Tone Mapping (ALTM) to enhance HDR display. The AP0101AT is aimed to Automotive Digital Surround View Systems, supporting 1.2MP video at 45fps and 720p video at 60 fps, and consumes 129mW. The AP0100AT supports 185-degree fisheye lens distortion correction, perspective correction and multiple view options such as split side view, triptych and trailer hitch. 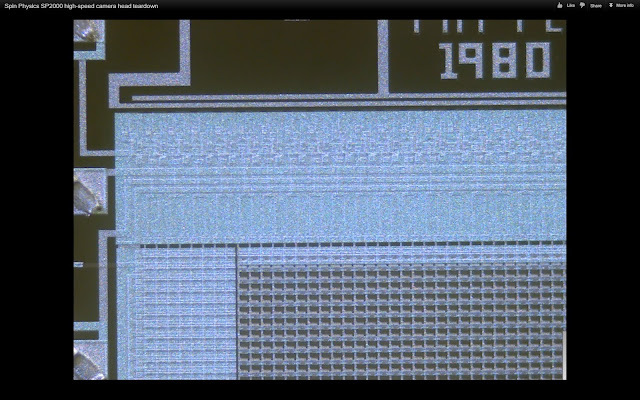 In addition, AT0100AT has overlay capabilities and integrated NTSC/PAL encoder and consumes 170mW. Currently, Aptina’s family of HDR megapixel automotive sensors includes the 1/3”-optical format, AR0132AT. Other sensors will be announced as they become available, including a ¼”-optical format 1.2-megapixel sensor, and a 1/5”-optical format WVGA sensor. The AP0101AT is available now in a 6.5mm x 6.5mm VFBGA package with 0.65mm ball pitch, and the AP0100AT will be available in Q1 of 2013. Both products are AEC-Q100 qualified. European Machine Vision Association is about to update its famous image sensors and cameras characterization standard to version 3.1. The published EMVA 1288 release candidate contains only a few refinements and additions to release 3.0, as listed in appendix D. The major additions are: total SNR curve including the spatial inhomogeneities in the double-logarithmic SNR plot, plots of horizontal and vertical profiles for illustration of the spatial inhonogeneities and the design of a template data sheet. The template defines QE, SNR and PTC plots. If there are no objections against the new release, it will become final and will replace release 3.0 on January, 14, 2013. 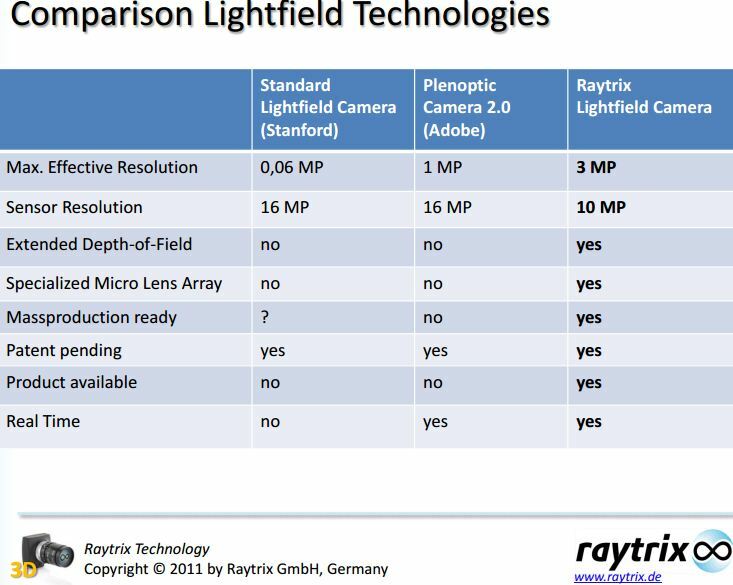 The latest Raytrix R11 camera has an array of about 20,000 microlenses, produces 2.7MP images out of 11MP sensor and uses a fast Nvidia GeForce GTX 580 card to deliver 30fps video. The camera costs 20,000 euros. 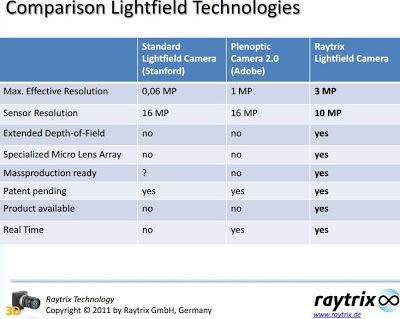 A nice overview of light field cameras was published by IEEE Spectrum in May 2012. Korea and Taiwan will then need several months to qualify their modules with the unit, and then phone makers will need another few months to qualify the modules in their phones. 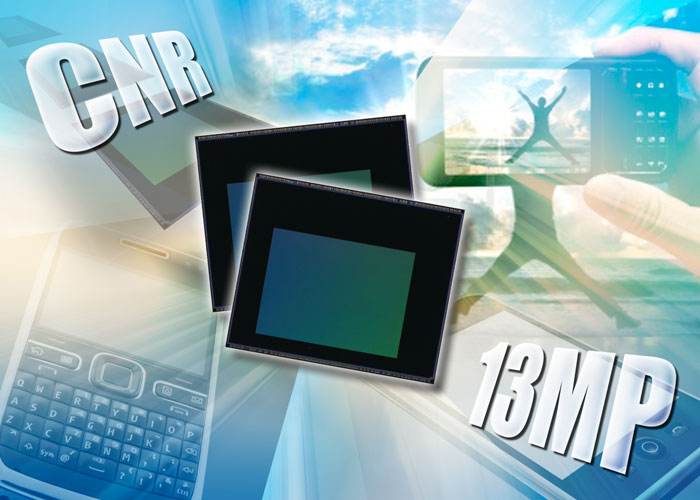 "In our CMOS image sensor product line, the delay of Win 8 launch from Q3 to Q4 affected our shipments of 1 mega-pixel sensor during the third quarter. However, we expect such demands to resume starting Q4 thanks to our design-wins with a number of tier-one laptop names. Beyond laptop, we have also won design-wins in smartphone, tablet and surveillance applications from a wide range of customers. We also launched a 5 mega-pixel sensor in the third quarter which targets smartphone market. It will begin some shipment in the fourth quarter. Our wafer level optics experienced double digit growth during the third quarter. The production of WLO for VGA, or 300,000-pixel, lens in our fab has been made smoothly with high and stable yields. With that, we are moving up the scale to start sampling our WLO with HD, or 1 mega-pixel, resolution, which we believe has a good potential of taking up a meaningful amount of the front camera market for smartphone. We expect our HD WLO to start mass production in early next year." Up to now Aptina has used 8-inch Micron fabs. Generally, 8-inch wafer tools do not support processes beyond 90nm. 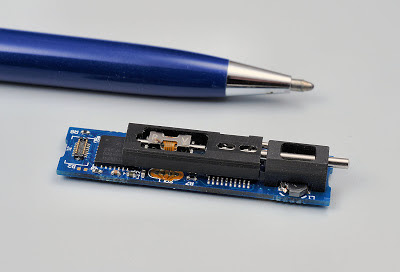 According to Farshid Sabet, VP and GM of Mobile Division at Aptina, the company plans to produce its next-generation BSI sensors on Micron's 12-inch fab (Digitimes). 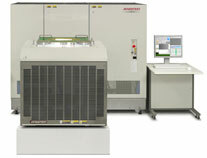 Earlier, there were indirect indications that Aptina is going to use 12-inch TSMC process. Digitimes: Pixart is set to post sales growth of up to 5% sequentially in Q4 2012, according to company chairman Huang Sen-huang. Pixart boost in shipments of its optical mouse chips. However, it will be offset by a decrease in shipments of its games console solutions. 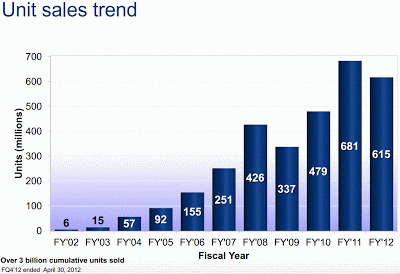 Pixart reported net profits of NT$120 million (US$4.1 million) on revenues of NT$970 million for Q3 2012. "Panavision Imaging is pleased to offer another high performance CMOS image sensor for industrial imaging applications", said Derrick Boston, President and CEO of Panavision Imaging. This is the third area sensor to be launched in PVI’s family of Dynamax sensors, joining the 3.2MP sensor (DYN0032) and HDTV 2.1MP (DYN0021) which are already in the market. Dynamax 17.4MP test samples have been released to various customers for their different market applications. The engineering grade devices will be available in a CPGA package by the end of 2012, in either color or monochrome versions. High volume production is planned in the middle of 2013. PMD´s partner Bluetechnix presents 3D ToF camera equipped with PMD PhotonICs 19k-S3 TOF 3D chip. The Argos3D-P100 camera captures depth picture at a resolution of 160x120 pixels with up to 160fps speed - claimed to be the highest framerate available for ToF cameras. 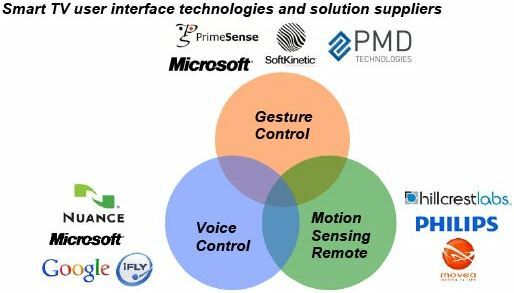 Law360.com: ST has settled claims brought by Caltech alleging STMicro, Nokia and RIM infringed image sensing technology patents. Administrative Law Judge issued an order Monday putting the proceedings on hold pending the end of an ITC investigation and said the settlement would resolve claims that STMicro made smartphone camera components that allegedly infringed Caltech's patents and sold the parts to Nokia and RIM. "Caltech has entered into a settlement and license agreement with [STMicro] that resolves all outstanding issues in this investigation," the judge said. The original lawsuit also included Siliconfile, SETi, Toshiba, LG and Pantech. Law360 article says that by now Caltech has settled with all defendants in that suit. The patents-in-suit are U.S. Patents 5,841,126; 5,990,506; and 6,606,122. Albert Theuwissen published a nice report from VISION 2012 Show being held these days in Stuttgart, Germany. A lot of interesting stuff there: 16MP two-dimensionally curved sensor from Andanta, full-frame 35mm sensor by CMOSIS, global shutter HDR sensor by NIT and more. "As volumes increase, a clear duality appears between companies that have adopted a growth strategy by focusing on low-end markets and those opting for a specialization in high-end and higher margin markets to maintain profitability such as STMicro and Aptina." Regarding the hidden Y-axis scale, one can estimate it from the previously published data here. P.S. Galaxycore's CAGR looks like much bigger than the stated 16%. Chipworks' iPad 4 teardown reveals two Omnivision sensors inside: the 5MP primary one with markings OV290BA and the 1.2MP secondary one with markings OV23CB. Apple iPad mini too uses Omnivision sensors: the 5 MP primary camera has the same markings as Chipworks saw in the 5th generation iPod touch while the 1.2MP secondary camera is identical to that seen in the iPad 4. Update: EETimes: UBM Techinsights confirms Chipworks' iPad 4 findings. PR Newswire: OmniVision announces the OV5656, a cost-effective 5MP CameraChip sensor for smartphone, tablet and digital video camera (DVC) markets. The 1/3.2-inch OV5656 features 1.75um OmniBSI+ pixel with 1200mV/(lux*sec) sensitivity and delivers 30fps at full-resolution. "Industry reports are predicting an annual demand of more than 450 million 5-megapixel image sensors over the next three years, and the OV5656's high performance and competitive cost structure make it a highly desirable camera solution for OEMs across multiple markets," said Vinoo Margasahayam, senior product marketing manager at OmniVision. 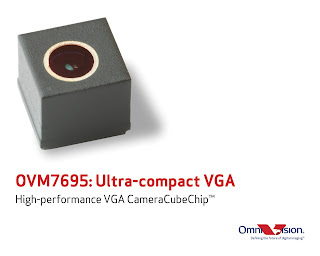 "Compared to the previous-generation OV5650, the OV5656 delivers several performance improvements, including full resolution, high-speed 5-megapixel photography at 30 FPS, a 28 percent improvement in full-well capacity and significantly improved dynamic range in a smaller die size." The sensor's integrated scaler allows it to record 1080p HD video at 30fps with electronic image stabilization (EIS) while maintaining full field-of-view (FOV). Using 2 x 2 binning functionality with post-binning re-sampling filter, the OV5656 can capture 720p HD video at 60fps. The OV5656 has 4-lane, 840Mbps/lane MIPI interface and LVDS serial output. The sensor's power consumption is 339mW. The OV5656 fits into a module size of 8.5 x 8.5 with a z-height of less than 6 mm. It is currently available for sampling in both RW and CSP. PR Newswire: TowerJazz is going to show its CIS customers products at VISION Show 2012 on November 6-8, 2012 in Stuttgart, Germany. The demonstrations will include: ON Semiconductor's VITA industrial image sensors, e2v Ruby sensors, the CMOSIS CMV family, the AnaFocus LINCE5M sensor, the Viimagic industrial sensor series, and the Truesense Imaging Inc. industrial CMOS sensor. Among TowerJazz's R&D partners in the show are: CSEM, Fraunhofer, and STFC. TowerJazz is a provider of a wide range of pixel IP and an experienced R&D team that supports complex joint development projects. TowerJazz's 0.11um pixel design rule has been released for early adopters' designs. First product samples of this new platform were already delivered. "TowerJazz is the only foundry exhibiting at VISION and we aim to establish our technology leadership and reinforce our relationships with existing customers as well as showcase our unique CMOS image sensor technology to make our offering more familiar to the end user," said Dr. Avi Strum, VP and GM, CIS Business Unit. "We are looking forward to participating at VISION to share our unique technology offering with attendees and connect with our image sensor partners to continue addressing our customers' growing needs." "The industrial camera market is expected to grow steadily and to top $600M by 2016. Among the machine vision applications, intelligent traffic systems are experiencing very high growth," says Paul Danini, Technology and Market Analyst, Imaging Technologies & MEMS Devices, Yole Developpement. Some of these technologies are based on sensors and optics. Primesense uses structured light 3D camera. Softkinetic and PMD use ToF cameras. Philips relies on IR triangulation for its motion sensing remote. Keith Wetzel, a member of Truesense Imaging business development group, twitted that the new 12MP 4.7um pixel KAC-12040 CMOS image sensor "has an SNR10 value of ~7 lux." The lens aperture is not specified. Slide 11 of Sony Q2 FY2012 earnings presentation says that "sales of ... image sensors are expected to be lower than previously anticipated, segment sales are expected to be lower than the August forecast". No reason for the forecast reduction is given. 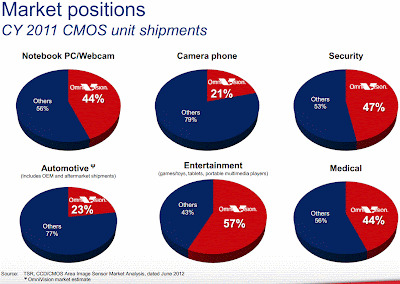 Seeking Alpha earnings call transcript quotes Yoshinori Hashitani, Sony VP Investor Relations, saying that last quarter "sales of the image sensors increased because of strong demand of smartphones and other products". "FIGS. 7 and 8 [not shown here] compare the read noise achievable with optimized PMOS technology vs. standard CMOS technology wherein the source follower is formed in NMOS having flicker noise lower than readily achieved in common foundry processes, i.e., very good compared to what is readily available. Even so, the PMOS global shutter can yield a read noise of 1 e− (or holes) at a sense capacitance of 5 fF. The NMOS global shutter circuit instead has read noise of 3.5 e− at 5.5 fF. 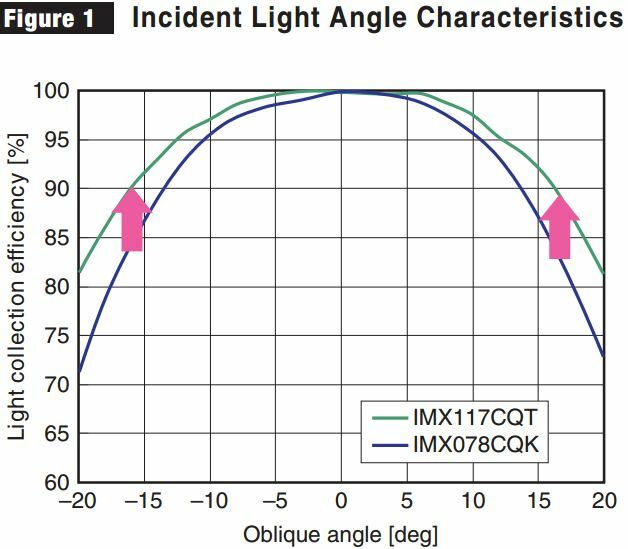 More importantly for long term development, the PMOS solution goes well below 1 e−0 as the sense capacitance is reduced while the NMOS solution plateaus well above 2 e−." Toshiba published a product page of 8MP 1.4um BSI pixel-based T4K34 sensor. The sensor did not appear on the previously published Toshiba roadmap. The new sensor is quite fast, delivering 30fps at full resolution and the same frame rate in 1080p mode. Its ADC resolution is selectable between 8b or 10b. The new Digital Camera Database has an information on pixel size, sensor areas and more from 3281 digital cameras. The information is nicely presented in graphical and numerical form. It's hard to believe that the whole web site is just one-man job! Thanks to GB for the link! 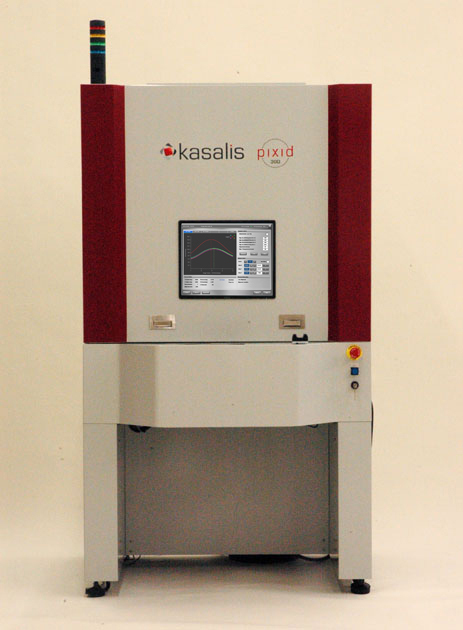 Kasalis announces the release of its Pixid 300 line of fully automated camera module assembly and test systems, featuring its active alignment technology. The Pixid 300 Pro and Pixid 300 Test models are now available for shipment. "The increasing demands for improved image quality in mobile cameras has transformed the camera module industry, which now needs a cost-effective solution to meet the higher level of precision required in the alignment process," said Justin Roe, president of Kasalis. "The Pixid 300 Pro is a clear breakthrough that is changing the cost-benefit equation of active alignment for the whole industry. We have created a disruptive technology – the Pixid 300 Pro performs pre-dispense tests, adhesive dispense, dispense verification, active alignment, UV cure, and post-alignment tests all within 15 seconds, with a throughput of over 240 units per hour, and all for very competitive pricing." The Pixid 300 Pro model is a fully automated manufacturing system featuring active alignment, customizable optical testing options, Adaptive Intelligence SPC, and automated adhesive dispense and UV cure. Each stage of assembly is performed in parallel to obtain the fastest possible throughput time. Adaptive Intelligence is a software suite that is embedded in the Pixid systems and improves the alignment process by using the machine feedback to improve its algorithms, thereby attaining faster speeds and improved yields. In addition to the Pixid 300 Pro, the series includes the Pixid 300 Test model, which is intended purely for the automated functional testing of camera modules. 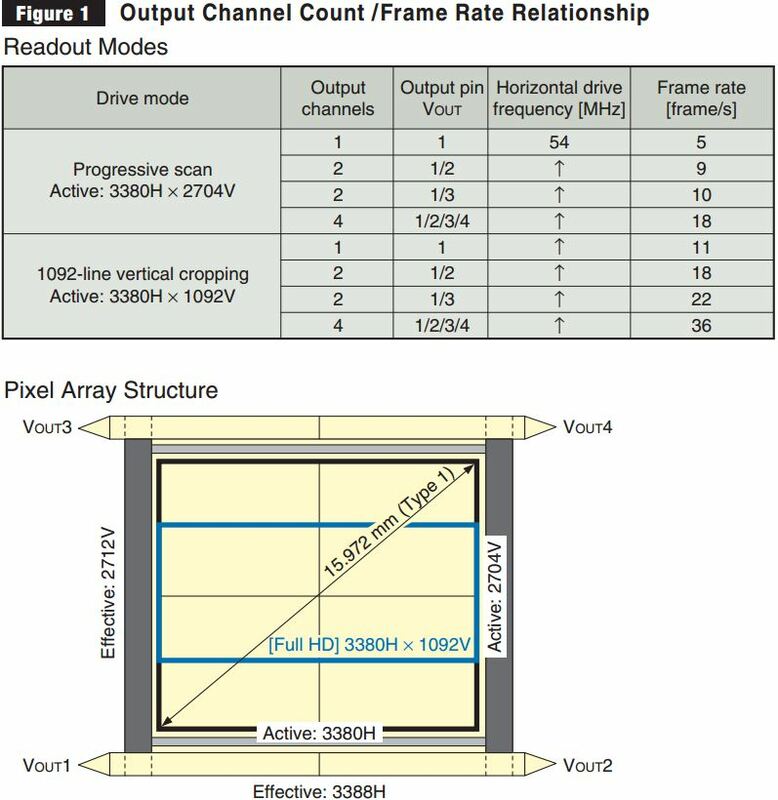 The Pixid 300 series systems are designed for high volume production of camera modules such as those used in smartphones, automotive applications, webcams, medical imaging, and security cameras. 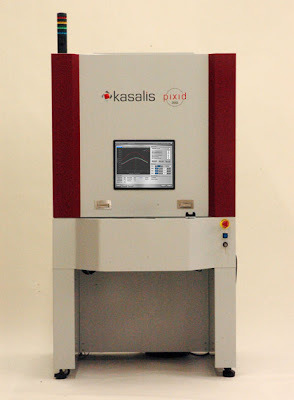 Kasalis has designed all of the Pixid systems to solve industry challenges, provide easy upgrading and maintenance through modular parts, and to align a camera lens to a sensor in up to six degrees of freedom to obtain the best possible focus quality across the entire image sensor. 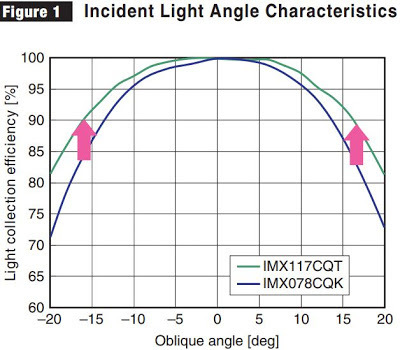 As technology in mobile electronics advances, camera modules assembled with precision alignment are increasingly important. PRNewswire: OmniVision announces what it says is the industry's most compact VGA CameraCubeChip to date: the OVM7695. The camera module size is just 2.4 x 2.4 x 2.3 mm. The sensor is based on 1.75um OmniBSI+ pixel. "Front-facing cameras have quickly become a defining feature in mobile devices. As these devices continue down the path of miniaturization, manufacturers are tasked with providing a better video recording experience within tighter space constraints," said Aaron Chiang, senior technical marketing manager at OmniVision. The OVM7695 is currently sampling and is expected to enter volume production by the first quarter of 2013.